In truth, the origins of campus police departments are deeply steeped in racist traditions. The development of university police departments initially arose in response to the social movements for racial equality in the 1960’s and 70’s, and, more specifically, the de-segregation of public schools and the increase in educational opportunities for people of color. University police departments came into widespread existence primarily as a result of the increasing presence of people of color in institutions of higher learning, and, much like the broader institution of policing in the U.S., campus police officers have, historically and now, often served to repress and stifle protest and dissent originating from Black and Brown students and student organizations. Additionally, 92 percent of public universities, which are significantly more likely to be more racially diverse, have armed police forces incorporated into the university system, compared to just 32 percent of private universities, which are significantly dominated by white, middle-class student bodies, even though public and private universities often exist in cities and communities with similar rates of crime. This juxtaposition between the presence of armed police officers on public campuses and the lack of armed police officers on private campuses, then, is not based on differences in crime rates between the communities that these universities exist within, but on racist assumptions of the inherent criminality of a more racially diverse student body. We assert, then, that campus policing, just like the broader institution of policing, is a deliberately radicalized institution, one that acts primarily to preserve and uphold the racial inequalities that exist in broader society within institutions of higher learning, and to reinforce the stereotypical criminalization of Black and Brown folks. The participants of the occupation will not relent until all of these demands are met in their full form, and will accept no proposals that do not meet these demands in their entirety. We urge President Shoureshi and the PSU administration to take these demands seriously, and to take visible and timely measures to begin addressing these demands and taking responsibility for Jason Washington’s unjustified murder. 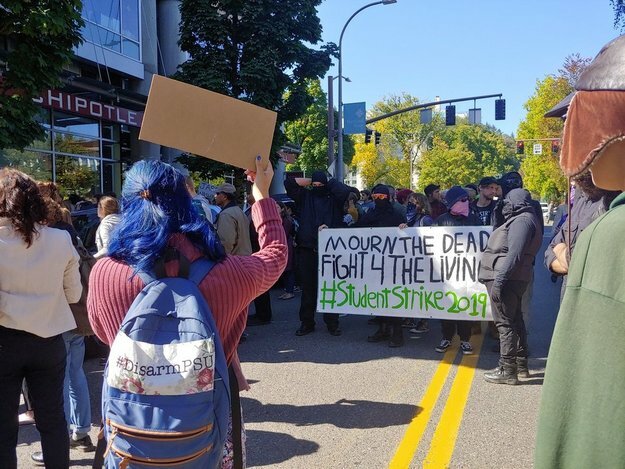 We are calling for immediate solidarity with Portland State University activists, the Washington family, and the fight against the arming of campus police officers. Unjust murders like Jason Washington’s can be prevented. They will be prevented.